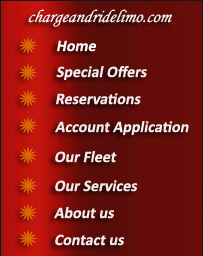 With years of experience in the car service industry, we can proudly guarantee that we will meet and exceed all your unique transportation needs. Whether it is an all-important trip to the airport, night around town or an upcoming annual convention for your company, look no further than CHARGE AND RIDE LIMOUSINE Inc.- the most trusted name for a Washington DC car service. Complete the following form to have a representative contact you.